We pasture bred our two older Boer does in October, so we don’t have a tight date on when they’re due but it’s going to be soon. The girls are double-wide, their udders are filling out, and Jessie in particular has started to spend a lot of her time lying down, moaning softly. Good thing I got some time today (after the 4-H activities this morning) to finish up the kidding stalls and warming huts. The girls were a bit nervous about the new digs, and squished into one stall together for a bit. They calmed down later. 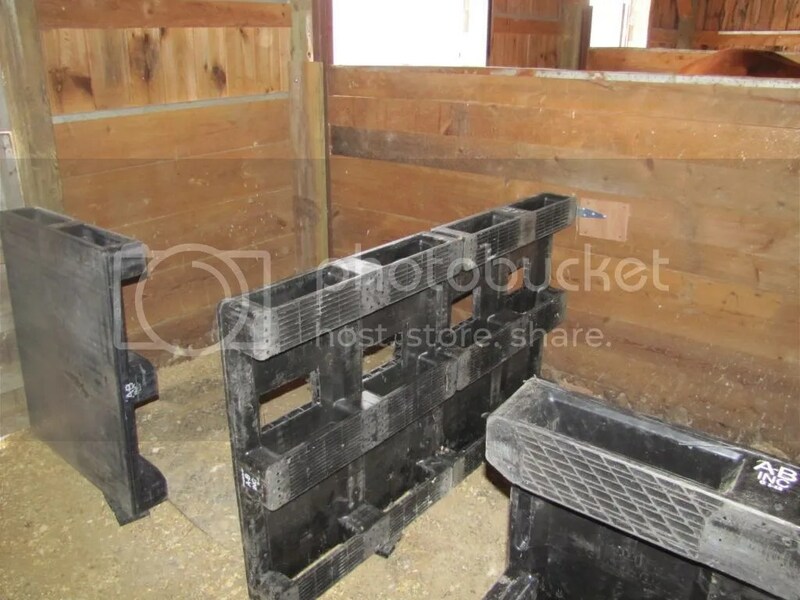 As I wrote earlier, we made the stalls primarily out of recycled hard plastic pallets. However, I got preoccupied with other chores and projects once I got the walls up, so it wasn’t until this week I was able to get the doors completed. I made those doors out of new lumber, mostly because I wanted them to be relatively clean and nail free. A better view of the door. You might notice that the center “bar” is connected differently. My plan is, once the kids are older, to remove that center piece and add another one offset to the side to make a barrier for our creep feeder. The idea is to have an opening small enough for the kids to get through to free-feed on grain, but tight enough to keep the greedy adults out. 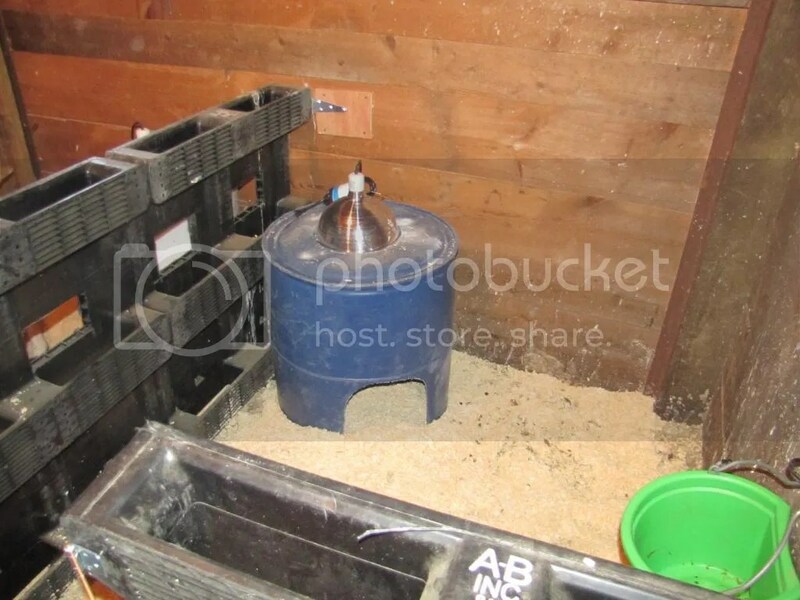 The next trick is to design a feeder to put in the stall that the kids can get to, but the ducks and chickens can’t. That will be a trick. The warming huts are salvaged 55-gallon poly drums, cut at the 2/3 point. I cut a circular hole in the top for the warming lamps, then used sheet metal screws to mount the brooder lamp fixture. The huts are screwed into the stall divider (which is made of dimensional lumber) to keep the adults from knocking them over. We took advantage of the long, though very cold, weekend to get a passel of projects done. The biggest job was digging out the goat’s stable – like many goat folks, we let it build up relatively thick during the winter, allowing the hay to compost and produce warmth. The disadvantage is that when the cleanup happens, it’s a lot of work. 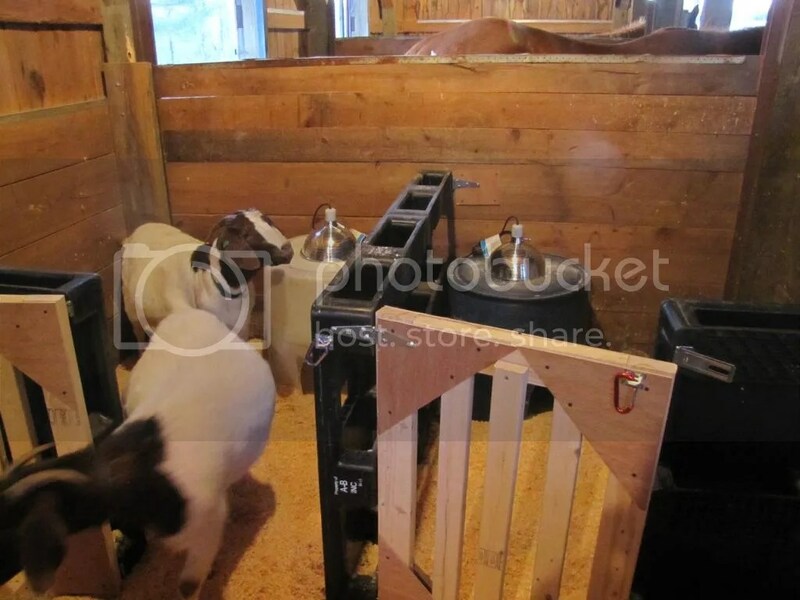 If we could redesign the barn, we’d make it so we could push the tractor’s bucket right into the stalls! I actually got a reprieve from that big job, and instead was busy with some construction projects and maintenance around the farm. Yesterday I did some light jobs – fixing the chicken coop doors, rearranging the feed room to make room for the brooders, modifying the new duck house. Today, I did a couple more projects while the rest of the family worked their butts off on the goat stall. 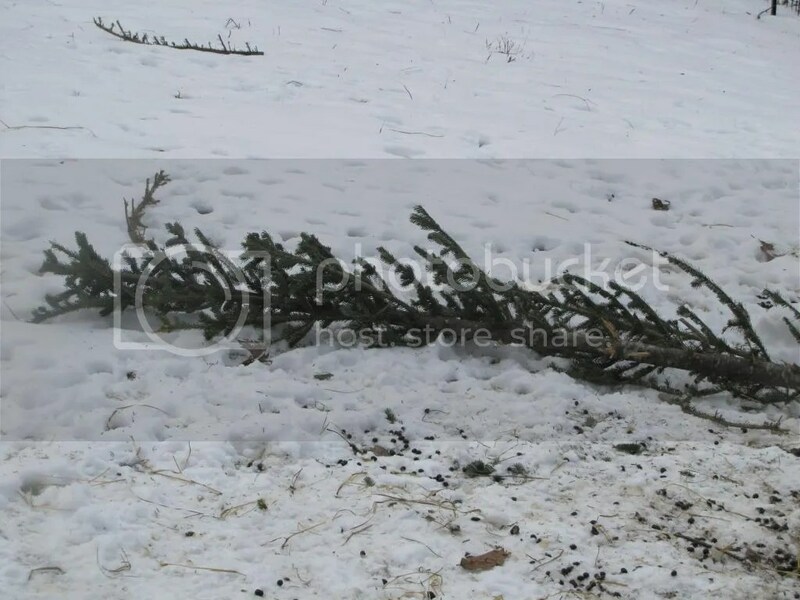 To keep the goats busy, we gave them the rest of our Christmas Tree – we’ve been handing them sprigs every day, but they made pretty short work of the tree today. 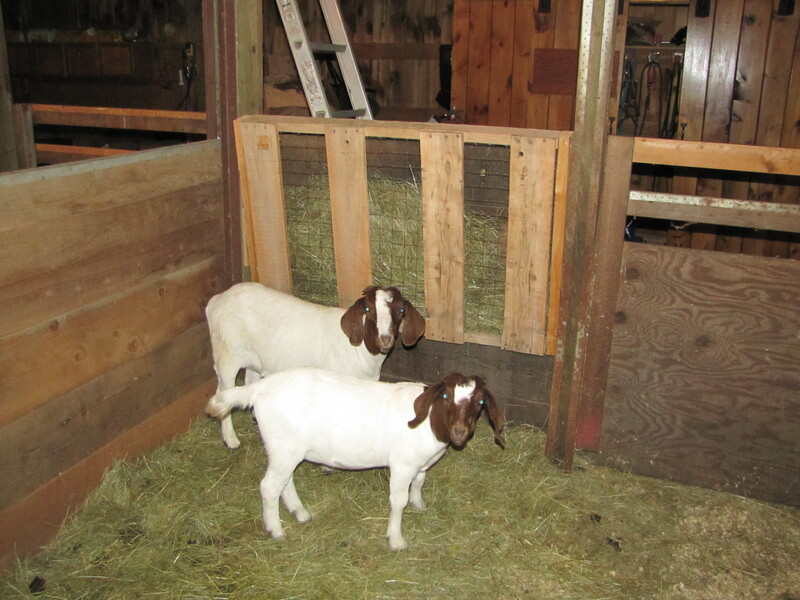 The first project today was to build the kidding stalls, as our two older goats, Gracie and Jessie, are due in March. Our plan is to open up the wall between their stall and the adjacent one (formerly the duck stall) and let the momma’s use the extra space. That wall is easy to remove – it’s dimensional lumber that slides in/out of brackets. Instead of buying plywood and 2x4s (have you seen lumber prices recently?) 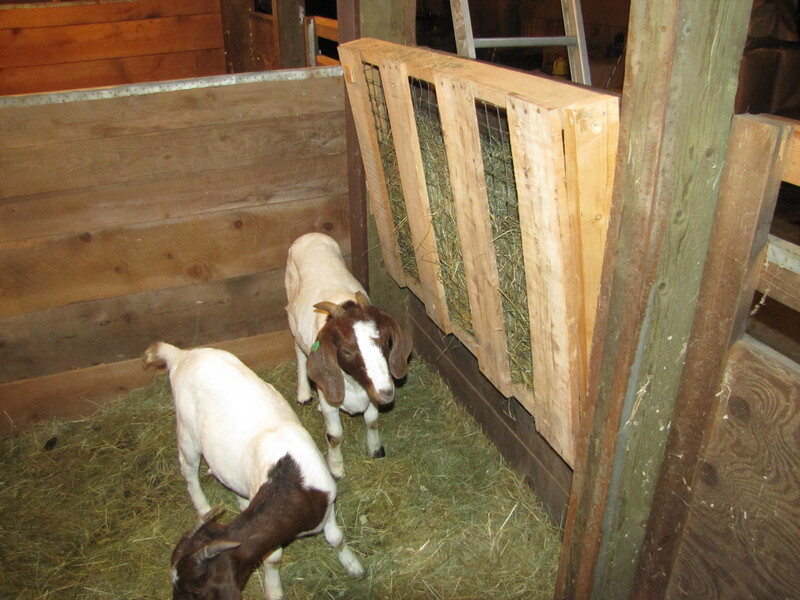 to make a wall sturdy enough for goats, I salvaged some heavy-duty plastic pallets and put them to work. 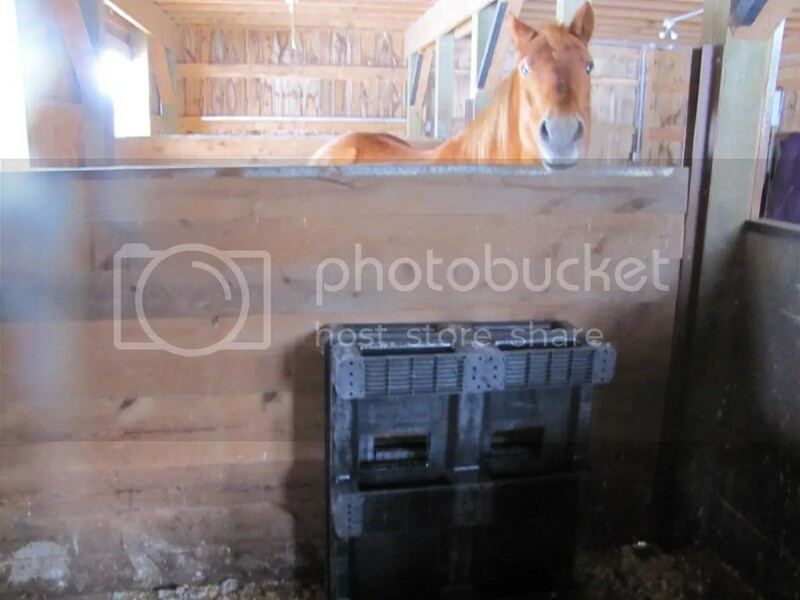 The resulting stalls are about 5′ x 5′, taking up about half of the 10’x10′ stall and giving us room to make 3rd or even 4th kidding stalls in the future. Voila! Kidding stalls! I cut a couple rectangular holes in the pallets to let the girls see each other. I wanted to make walls that would be sturdy, but still could be removed relatively easily, and came up with the idea of hinged walls that folded against the side of the stable. Jasper watches the walls unfold. All that’s left is to make the doors themselves, for which I plan to use some scrap lumber, or maybe wooden pallets. 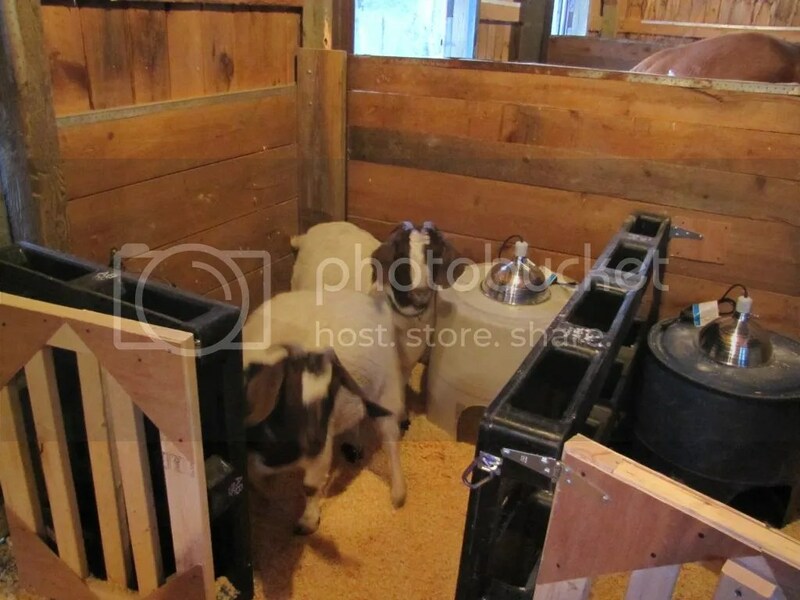 We’ll also make some lamb warming huts with some surplus 55-gallon poly drums I’ve salvaged. 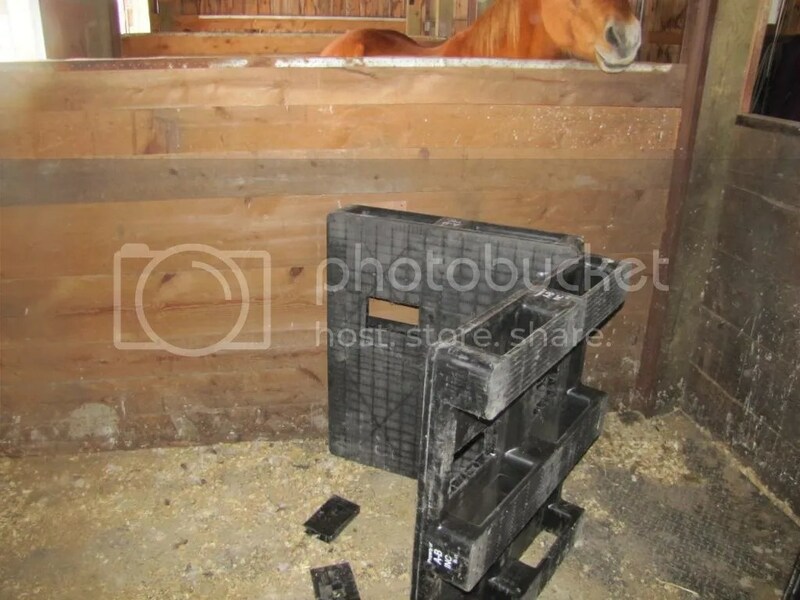 The next project was simple – a tray to catch the hay from the feeder. 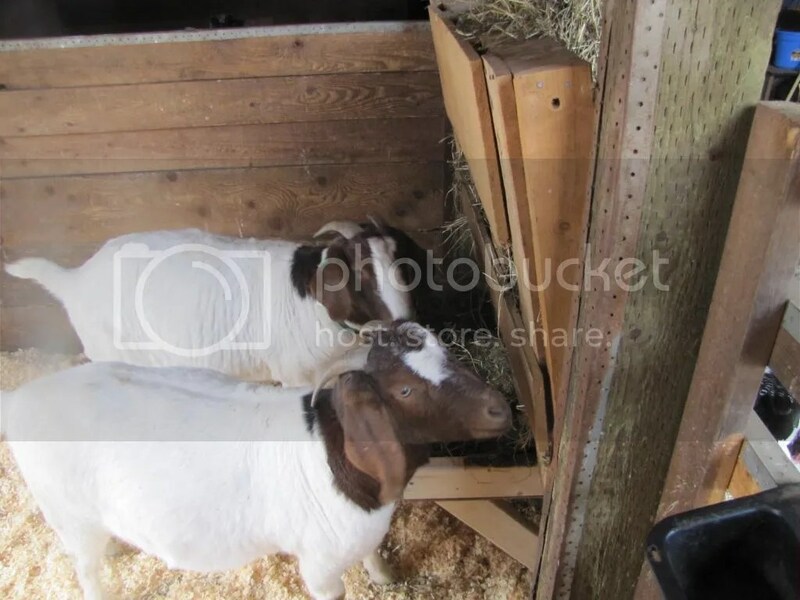 Goats are notorious hay wasters – once hay hits the floor, they’re not interested anymore, and it becomes bedding. My hope is that this tray will reduce that a little bit. Stand by for the next Flying T contest – guess the birthdate, #, and genders of each doe’s offspring! 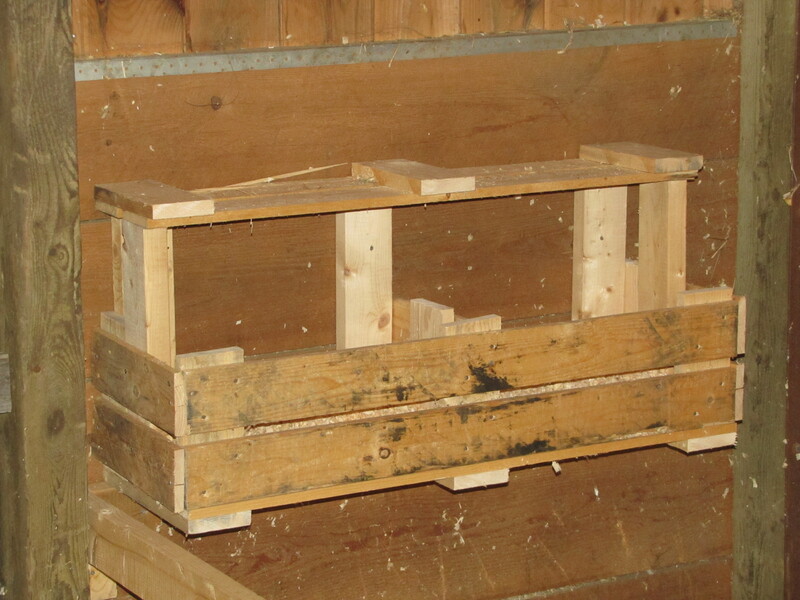 I’ve found a reliable source for used wooden pallets (as well as heavy-duty plastic ones from time-to-time). There’s always a use for them – whether it’s stacking firewood, scavenging the wood for another project, or using them intact (or mostly so) for one thing or another. 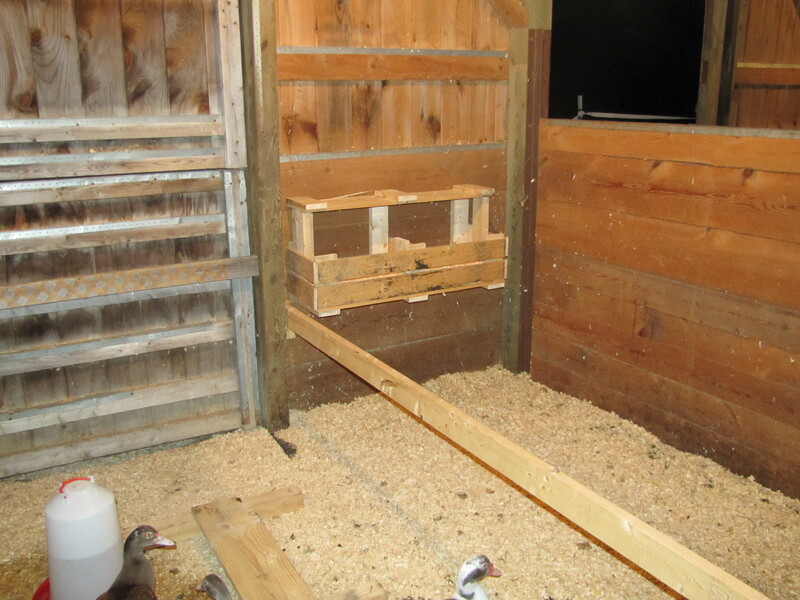 The muscovy nesting boxes started life as a 4×4 pallet. I cut it into four sections – one with three flat boards across (for the base), the other three with two. One of the smaller sections, I cut in half to make the sides. The other two made the front and roof. Some scrap 2×4 and pressboard (for the floor) and ecco! I took another length of 2×4 from the long section I’d been using to prop the peach tree limbs and put a perch across the barn stall. 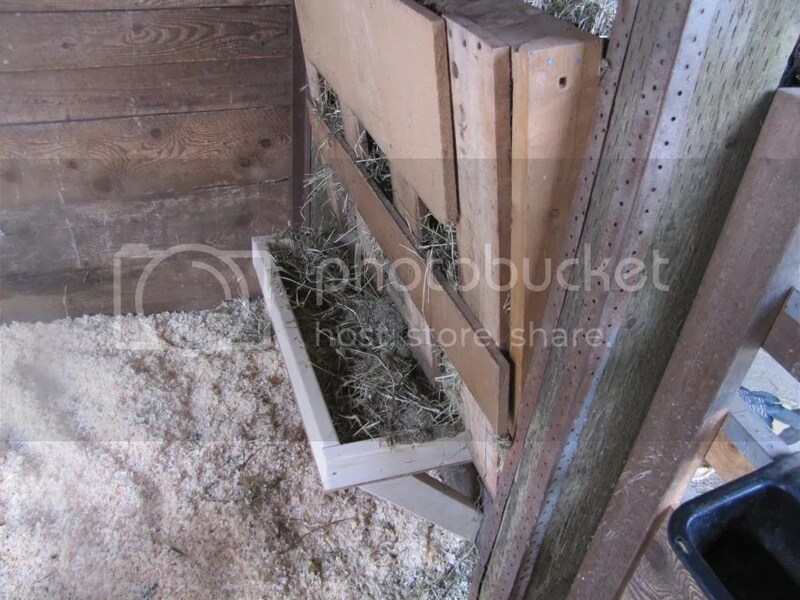 Note from the side view that I tilted the top out a bit so the hay falls down and forward as it gets eaten. It seems to work pretty well. They can pull hay out with their lips and tongue through the mesh, then munch on it without dropping much at all (note all the waste hay below from the previous method). Now to make an identical one for the shack in their mini pasture (behind the chicken coop).